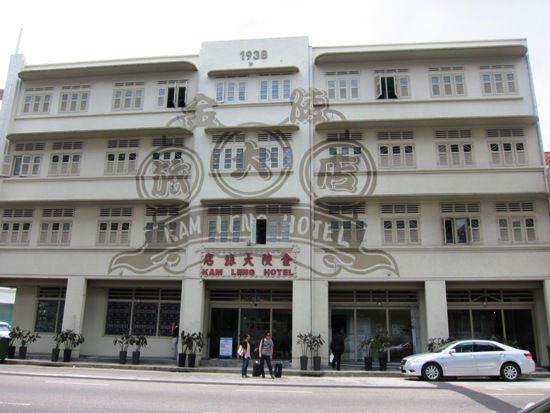 The 1938-built Kam Leng Hotel on Jalan Besar, a short walk away from Little India, was funkily refurbished and reopened in 2012 and offers clean and functional rooms in line with the simplicities of yesteryear but boasting nostalgic Peranakan charm. Average rating 7.2 from 3,411 reviews. 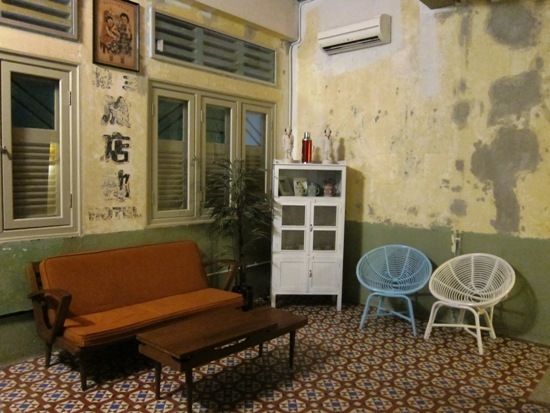 It may look more like a Geylang love hotel, but hey, don’t judge a hotel by its exterior. Entering the hotel, one’s senses are assailed by both old and new. The hotel hosts a groovy in-house restaurant called Suprette, which has a reputation for serving up great American fare that draws the weekend crowds. The bright lobby is decorated with an old signboard, fashion magazines and a radio from decades past. 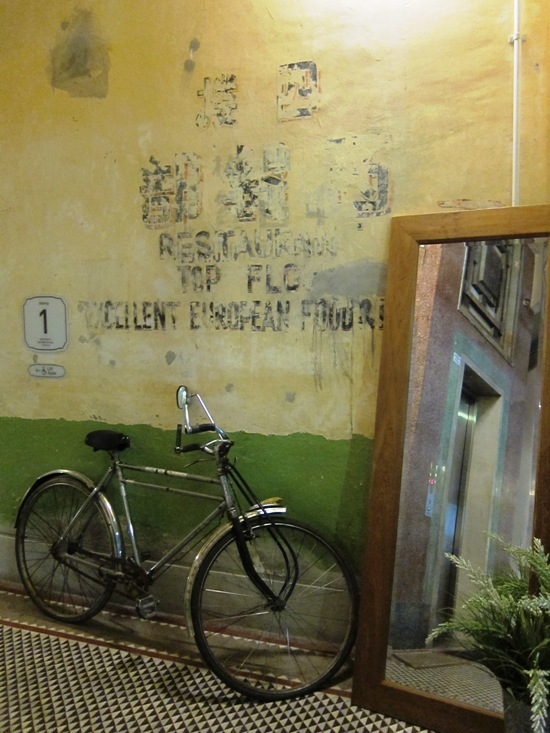 Turn towards the lift and stairwell, and you’ll find a vintage bike resting against a wall and tiles that look straight out of Singapore’s early housing apartments. That bike looks older than a lot of us at Travelfish! You’ll have to walk past some dark corridors and deliberately garish neon lights to get to Kam Leng’s rooms, which come in standard, superior and executive flavours (S$100-140, before tax). Each has a similar queen-size bed meant for two and allows for a child under 11 to stay at no extra charge using the existing bed (there is no room for another). The main differences between the rooms is their size. Don’t expect a fancy carpet or bathtubs – the tiles are simple and each toilet is basic and comes with a hot water shower. 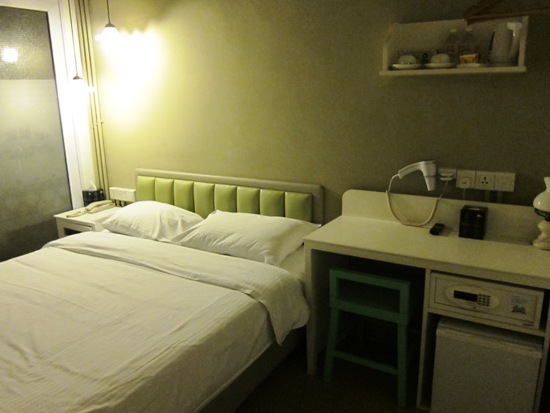 Each air-con room comes with free WiFi (available throughout the hotel), flat screen TV, safe and fridge. The only thing about the authentic feel of the hotel is that a lone traveller with a wild imagination might find Kam Leng just a tad too atmospheric and eerie. Upper floors have lift lobbies decorated in line with the vintage theme, which means they feature hard-to-find props – where did they find those grandmother thermos flasks and old posters? It is hard to tell whether the walls and floor have been designed to look worn, or were left deliberately untouched; either way, the tasteful design works. Exploring further, it’s amazing that this four-storey building, while not being able to house more facilities than Suprette, does manage to squeeze in more than 70 rooms, a communal bathroom (boasting vintage graphics) on the first floor, and an al fresco area on the second floor reached by spiral staircase where you can sit and chat, and where Suprette sometimes holds barbecues. A little piece of old-style Singapore. Staff will point you in the direction of gyms nearby and will help with bookings for key Singapore attractions. Depending on the package you choose, you get breakfast at Suprette thrown in for $10, which is a good deal given the quality of food there. But if you want to go local, while sadly the 24-hour Lavender Food Square just opposite the hotel has closed, there are plenty of other hawker centres within easy walking distance. Finally, while it’s slightly off the centre of town, it’s within walking distance to the Little India area and both the Farrer Park and Lavender MRT station are each about 10 minutes away on foot. 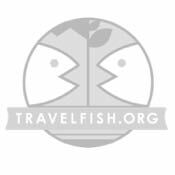 Overall, it’s a great deal for couples, considering that some hostel rates are not far off per person. And you’ll be able to explore a slice of Singaporean history — this building is older than a good many others in Singapore. Shop online for a competitive discounted rate as we’ve found booking direct here to be consistently more expensive that with Agoda.com and other online agents. Check rates at Kam Leng Hotel on Booking.com.